Last week I nattered on endlessly about The Disreputable History of Frankie Landau-Banks and mentioned, briefly, that it was a finalist for the National Book Award. 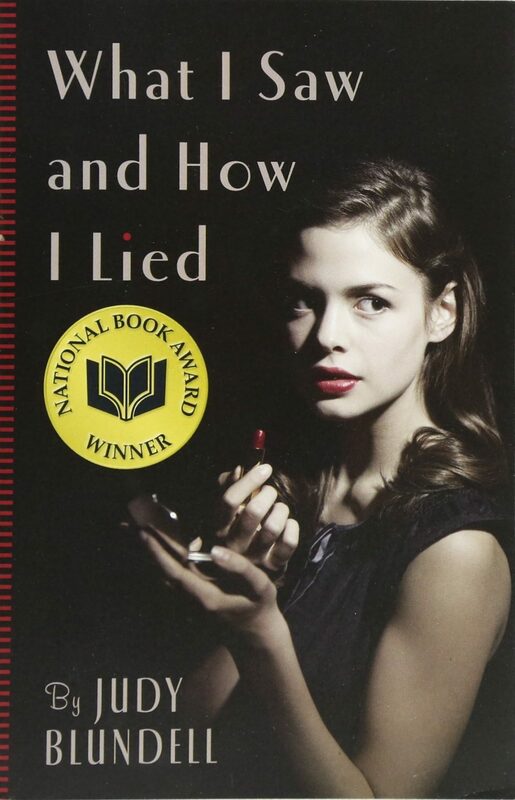 This book, What I Saw And How I Lied, is another of those finalists. My vote? Is still 100% on Frankie Landau-Banks. What I Saw And How I Lied is about 15-year-old Evie, who is celebrating the recent end of World War II and the return of her charming, handsome step-father, Joe, who fought in the war and then was stationed in Europe for a year afterward. Now he is home, back with Evie and her beautiful mother, and has opened three successful appliance stores. Life seems back to normal. And yet, just as everyone is adjusting to a new and pleasant existence, the phone begins ringing off the hook for Joe, and for whatever reason, the caller is making him very tense and angry. Finally, one day, he declares that they are going on an extended vacation to Palm Beach. Off the three of them drive, reveling in the availability of gas and vacations. Shortly after they arrive, Evie meets Peter, a young GI, who served with Joe. Joe is not thrilled to see Peter, but Evie quickly finds herself falling in love with him. And, despite the 8 year age difference, he seems to like her too, taking her and her mother out to various activities nearly every day and stealing the occasional kiss. Evie, who recognizes that she is no beauty like her mother, is anxious to grow up and is thrilled by the attention Peter is paying her, but also can’t help noticing that tension is growing between her mother and Joe. Joe is talking about buying a hotel in Florida with a man he’s met during their trip, and perhaps never returning to New York. All these issues come to a head when Joe insists on taking a boating trip with his wife and that Peter accompanies them. They are lost in a hurricane and Evie is left at the hotel to worry and wait. It’s hard to describe this book, actually, as it kind of wanders around for about two-thirds of the book, until after the hurricane, where suddenly there is questions of foul play aboard the boat and it ends up in a highly-publicized court case. Evie has to testify and she is forced to decide who to protect and reevaluate her experiences since arriving in Florida. Frankly, I didn’t love this book – too much rambling and a bunch of characters I found pretty unlikable. If you’re looking for a great, thought-provoking, page-turning read, I’m afraid you may want to look elsewhere. If this book wins the award in two weeks, I will be astounded (and not in a good way). i love how passionate you are about all of these books!! i am reading by the shore by galaxy craze right now…i think that it is a teen book?? not sure, but so far so good!! i don’t usually read things that haven’t been recommended! so i took a chance and i am having everyone read it at book club…i hope it doesn’t stink!! i love all of your reviews…one of these days i will read one! Sounds like it had the potential to be really good. Somehow it doesn’t sound like something that young people would want to read.